Pumpkin seed is a good source of zinc and unsaturated fatty acids, which are effective, help for prostate ailments. Cholestatin is a plant sterol, rich in beta-sitosterol, campesterol and stigmastereol. these plant sterols can be utilized by the body to help maintain health cholestorol levels by blocking the absorption of dietary cholesterol. Recent Cholestatin research is beginning to demonstrate the reduction of and protection against benign prostatic hypertrophy (BPH-enlarged prostate). MSM is needed by the body for proper enzyme activity and hormonal balance, along with the proper function of the immune system. 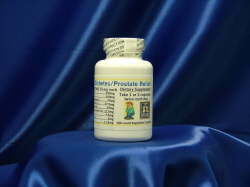 Saw Palmetto contains powerful phytonutrients shown in dozens of studies to interrupt the hormonal mechanism that causes the prostate to be enlarged. Stinging Nettles Leaf contains phytosterols that produce a powerful anti- inflammatory effect on enlarged prostate tissue. When combined with an extract of the herb Pygeum Africanum, may inhibit the hormonal changes that lead to BPH. Pygeum Africanum contains vital nutrients shown to produce powerful anti-inflammatory effect on the prostate. It appears to work by reducing inflammation, promoting urination and ridding the prostate of cholesterol deposits that can occur with BPH. Pregnenolone, while not the most abundant naturally occurring hormone in the body, that title is given to DHEA, it is considered the real "Mother Hormone". The internal synthesis of steroid hormones begins when the body converts cholesterol to pregnenolone, creating the basic hormonal substance. Pregnenolone, as a natural hormone precursor, is then converted into DHEA, which in turn is converted into androgens, estrogens, and other steroids. Pregnenolone also has the ability to form other hormones such as progesterone. Like DHEA, our body's production of pregnenolone declines with age. Pregnenoloe has been found to increase productivity by combating fatigue and increasing metal alertness and awareness, improve long term memory, improve mood, reduce stress and is found to be an excellent anti-inflammatory. Alpha Lipoic Acid is a "universal" antioxidant and bio-energetic nutrient shown to restore proper glucose metabolism to diabetics. It has shown to be helpful in supporting your body's ability to nutritionally support normal insulin levels. Lycopene is a powerful antioxidant that may help prevent prostate cancer.